Welcome to the Healthy Eating Policy of S.N. 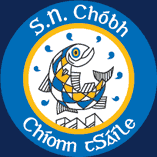 Chóbh Chionn tSáile. It has developed by the school’s Health Promotion Committee in consultation with parents, students and teachers of S.N. Chóbh Chionn tSáile, and with assistance from the HSE South Health Promoting Schools Co-ordinator. This policy aims to make everyone in the school aware of the importance of a healthy diet and to encourage students and teachers to make healthy food choices. Feedback and recommendations from the parents’ questionnaire, findings from lunch box survey, suggestions from staff and pupils and input from the ‘Food and Nutrition for Primary Schools’ (Dept. of Health and Children) were incorporated. The awareness of declining fitness and health in children, nationally. As part of the school’s SPHE (Social, Personal and Health Education) programme, learning about food and nutrition. To make everyone in the school- teachers, parents and children aware of the importance and benefits of a healthy diet. To encourage all to make healthy food choices. To clarify for everyone which choices are available, and which choices we will be discouraging. We will regularly display and discuss the food pyramid, on which we are basing our nutrition policy. Tasting and sampling a wide variety of foods will be encouraged during geography and other lessons when appropriate (subject to children’s individual diet and allergy considerations where appropriate – please inform us of these on the enrolment form). Cereal Group: Bread, sandwich, roll, bagel, pitta pocket, crackers, rice-cakes, pancakes, wraps, pasta, potato salad, etc. Milk/Dairy group: Milk, cheese cubes, or on sandwich, yoghurt, smoothies, etc. Protein/Meat group: Hard boiled-egg, chicken chunks, cold meats in sandwich or salad, tinned fish, hummus, etc. Drinks: Water, milk, pure fruit juices, sugar-free fruit squashes. The aim is to encourage as varied a diet as possible. Exceptions will be allowed, at the teacher’s discretion, at end-of-term, at parties, school trips, concerts or sports events. We ask you to please co-operate with us in implementing this policy, and keep to the guidelines given. The benefits will be seen in the children’s health, fitness and concentration levels.